Back in 1994, the Ultraverse launched their third trading card series entitled, SkyBox Master Series: Ultraverse Edition. This was a 90 card set with a handful of chase cards. What distinguished this series from other trading cards on the market was all the artwork was painted by the amazingly talented Dave Dorman! 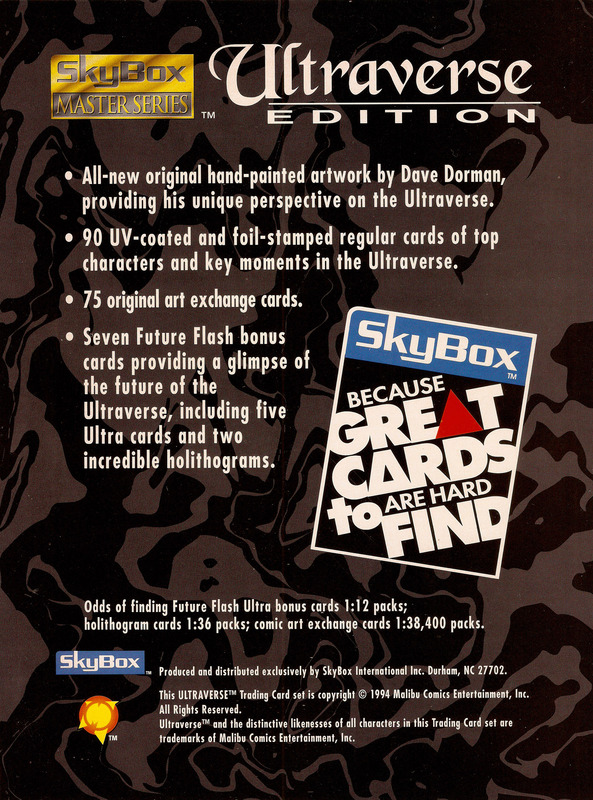 The cards are beautifully painted and very representative of the 1990s. If you wanted comic book painted artwork in the early 90’s, Dave Dorman was the guy to get (I still love his Dark Horse Comics Indiana Jones covers). 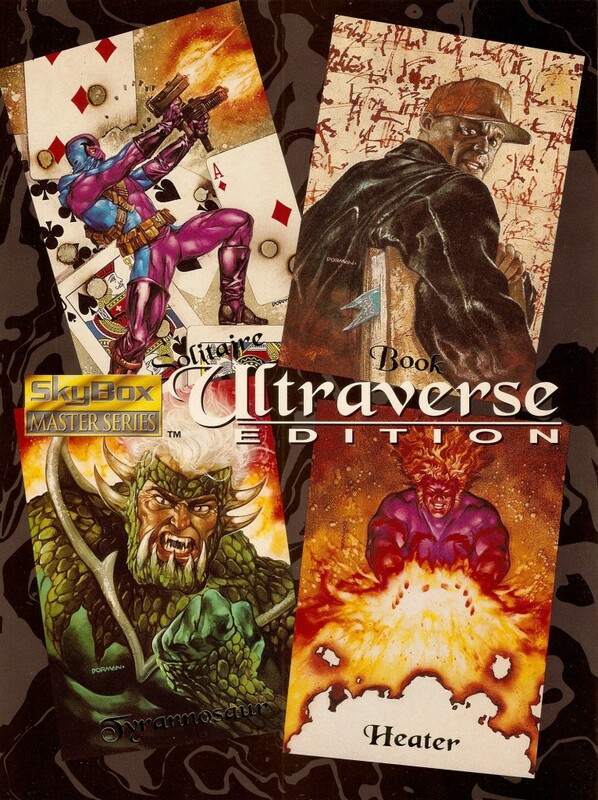 Not all the Ultraverse likenesses were captured perfectly in this trading card series, but the trade off is gorgeously painted artwork you wouldn’t normally find for these characters. I’ve seen many of the cards on the web (you may view most of them by clicking here), and have an unopened box I ordered last summer. I’m waiting for the right occasion to rip open the box and revel in the 90’s goodness! You’ll find a complete checklist by clicking here. Friend of the Ultraverse Network, Michael Bailey, recently sent me the following pages he scanned from an old 1994 Diamond Comics’ Previews catalog. 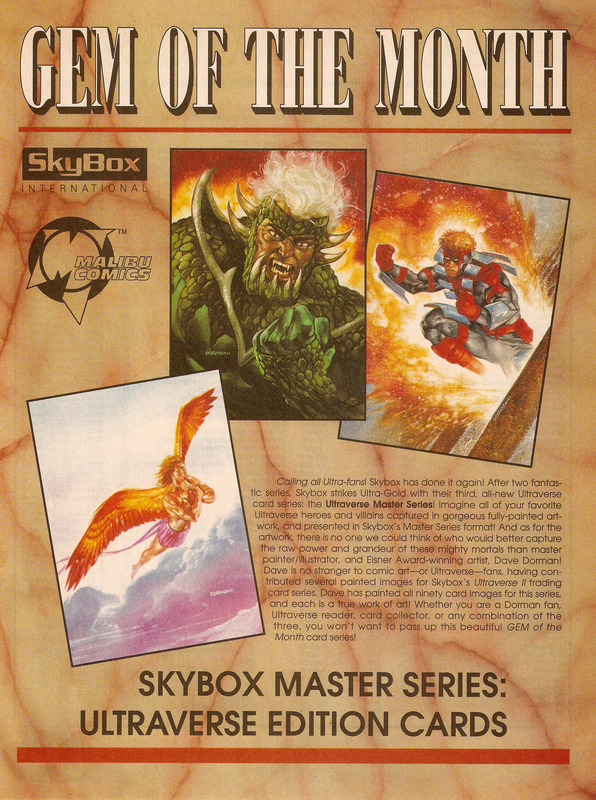 The first two pages were printed on glossy cardstock as an insert into the catalog, while the third page was the “Gem of the Month” featured advertising. I find the selection of characters in the ad somewhat puzzling. Solitaire was a solid choice, but Book, Tyrannosaur, and Heater?!?! That’s representative of the Ultraverse? Really? Not Ultraforce, Night Man, Prime, or even Lord Pumpkin? Odd. Being a marketing guy myself, I love seeing old advertising. Our thanks to Michael Bailey for sharing this snapshot of 1990’s merchandising!